of the couplers and replaced the torque generator with a brand new unit. compare it to. may end up making it a manual steering. have the shaft andwashers. I have added power steering to mine. Its poor compared to the power steering on other tractors I've had such as my JD 345 which has both a cylinder and valve. Even right after installation it was hard to keep a straight line. Seems to be typical of the torque generator systems. I swapped a DLX system into a manual steer Sunstar. My experience is constant minor corrections to make a long straight line. 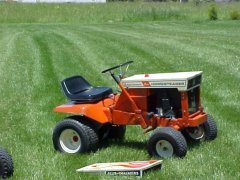 Mostly use it to plow snow in front of my shed in the winter, so it doesnt bother me much. since new and thought it was great. i have a neighbor with a sovereign w/ps. its pretty precise compared to this. will give it a try mowing and see how it goes. i assume the prestige isnt any better. uses the same generator. I have 2 prestiges, one is about a 03 or 04, and the other is about an 07. While they dont track perfectly and still need minor corrections, neither is as bad as the DLX ystem. The only gripe I have about those is that while the earlier one can be steered with 2 fingers, the newer one requires alot more effort. So much so its almost - but not quite- like manual steering. Havnt found the cause as yet. one too. what actual slop other than whats built in is on top of the spindle and the tie rod. the old t gen didnt leak. thoought mabe the knew on would have less slop. have reworked the couplers too. the prestige looks darn similar in all the other parts they use.